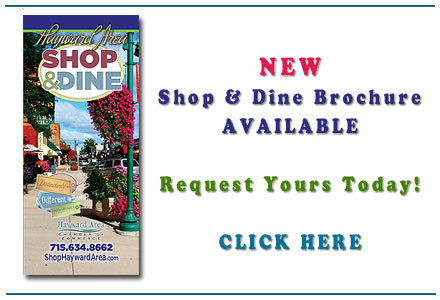 Click the image above to access a pdf of the Shopping and Dining Guide that you can print at home. You’ll have a map to follow as you stroll the Hayward shopping district. The Hayward area offers an eclectic mix of goods and services including antiques, flea market treasures, fine jewelry, Native American arts and crafts, leather goods, clothing, Celtic giftware, home and garden furnishings and accessories, books, novelty items, as well as items for the boating enthusiast and sportsman!